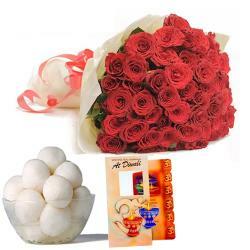 Product Consist : Diwali Card and Bouquet of 10 Red Roses with Box of Assorted Sweet (Weight : 500 Gms) along with Assorted Fire crackers (Worth Rs.300/-) (Note: Types of Fire Cracker are depends upon their availability no specific choice). 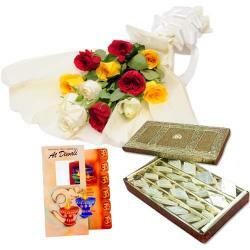 Have a look at this hamper that will definitely suit your gifting needs the best as it has everything delightful. 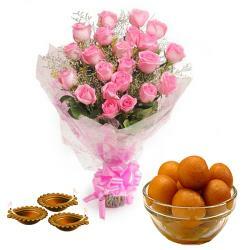 To make your dear ones happy and elated best is to tickle their taste buds. 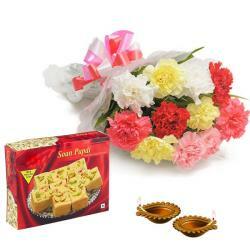 So we have clubbed tasty and delicious Kaju Katli that is made to melt in the mouth along with 10 Red Roses and Fire crackers and Diwali Greeting Card. 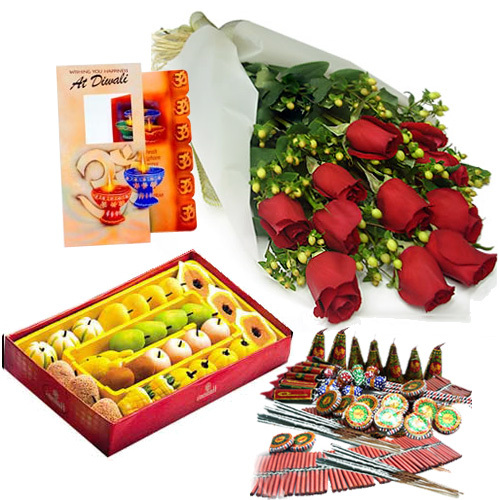 Product Includes : Diwali Card and Bouquet of 10 Red Roses with Box of Assorted Sweet (Weight : 500 Gms) along with Assorted Fire crackers (Worth Rs.300/-) (Note: Types of Fire Cracker are depends upon their availability no specific choice).